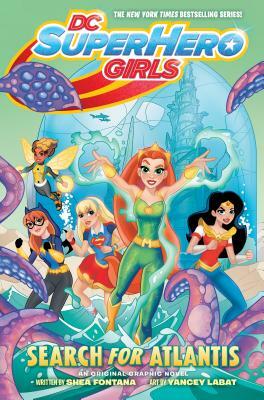 The critically acclaimed and New York Times bestselling DC Super Hero Girls series is back, and this time the class is joined by new students Mera and the Teen Titans' Raven! The celebrated series by author Shea Fontana continues with an underwater adventure in DC Super Hero Girls: Search for Atlantis. Things are going swimmingly for new students Mera and Raven, until the girls go on a field trip to Mera's hometown of Atlantis and find that the underwater city has vanished! Batgirl, Supergirl, Wonder Woman, Bumblebee, Raven, Miss Martian and Starfire discover that Atlantis has been shrunk and bottled by the powerful villain Brainiac! This gigantic problem calls for a small solution. To infiltrate Brainiac's bottled-city collection, Bumblebee and Raven combine technology with magic and shrink the heroes. But will they save the lost city of Atlantis, or will their little plan lead to even bigger trouble? Shea Fontana is a screenwriter for film and television, as well as a comic book writer. Her work includes the original graphic novels in the DC Super Hero Girls line, as well as TV shows The 7D, Doc McStuffins, Whisker Haven Tales with The Palace Pets and more.